Infections are frequent in patients with severe alcoholic liver disease, but are only independently associated with mortality when patients receive prednisolone, researchers report in the April issue of Gastroenterology. This could offset prednisolone’s therapeutic benefit. This study’s senior author, Mark Thursz, discusses the findings in a video abstract. As with other forms of liver failure, alcoholic hepatitis is associated with increased susceptibility to infection; 13%–25% of patients have an infection and a similar proportion develop an infection during treatment. Guidelines recommend the use of prednisolone, a corticosteroid with anti-inflammatory and immunosuppressive effects, for management of severe alcoholic hepatitis, although few studies have shown benefit beyond 28 days. In one trial, prednisolone almost doubled the risk of infections reported as serious adverse events (13% vs 7%). There is controversy over the relationships between prednisolone and liver function, infection, and mortality. Nikhil Vergis and Stephen R. Atkinson et al aimed to characterize the incidence and effects of infection in patients with severe alcoholic hepatitis using the data from the STOPAH trial. This double-blind placebo-controlled trial investigated the efficacy of treatment with prednisolone (40 mg daily) or pentoxifylline (400 mg 3 times each day). This study also investigated whether pretreatment circulating levels of 16S ribosomal bacterial DNA associated with subsequent development of infection in patients treated with vs without prednisolone. Analyzing data from 1092 participants in the trial, Vergis and Atkinson et al found that 135 (12%) had an infection at baseline. Chest infections were the largest category, accounting for 34% of infections. Cultures from 56 patients (41%) tested positive for microorganisms— E coli was the most common, detected in 30% of patients. While receiving prednisolone or pentoxifylline, 251 patients developed infections; 89 patients developed an infection after treatment with either of these drugs. Vergis and Atkinson et al found no association between pentoxifylline and the risk of serious infection, during or after treatment. However, patients given prednisolone had a 27% increased risk of infections classified as serious. Early-onset infection increases risk of death in patients given prednisolone. In patients who do not develop infection within the first 7 days, there is a nonsustained reduction in mortality at 28 days (A). However, in patients who have early onset of infection, prednisolone is associated with a large increase in mortality (B). 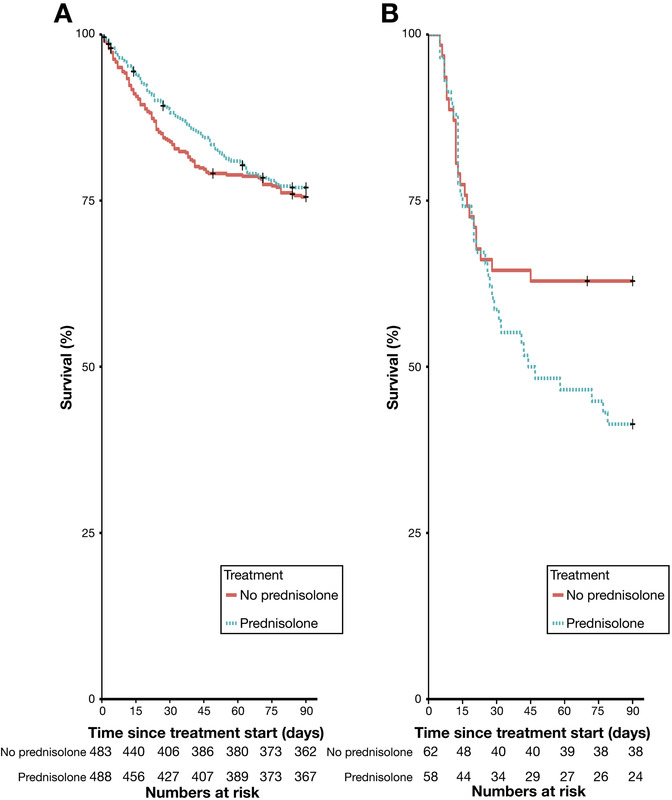 In patients who developed infection within the first 7 days, prednisolone greatly increased the risk of mortality within 90 days (see figure), independent of model for end-stage liver disease or Lille score (odds ratio, 2.46). The authors speculate that 7 days of prednisolone therapy may be enough to impair host immunity to allow development of serious infection, and that discontinuation of steroids after 7 days may be unable to reverse the damage. Among patients not receiving prednisolone, the effect of infection on 90-day mortality was secondary to baseline liver impairment and early improvement in liver function. High circulating levels of bacterial DNA within 7 days of prednisolone therapy increased risk of infection almost 5-fold, independent of model for end-stage liver disease and white blood cell count (odds ratio, 4.68). The translocation of bacterial products from gut to portal vein in heavy alcohol drinkers has been proposed as a mechanism of hepatic injury and cause of hepatic inflammation patients with alcoholic liver disease. In patients who did not receive prednisolone, infection was not independently associated with 90-day mortality or levels of bacterial DNA. The authors conclude that infections are common among patients with severe alcoholic hepatitis: 12% of patients have infections at baseline and 23% develop infections during treatment with prednisolone or pentoxifylline. Prednisolone is associated with a significant increase in the risk of serious infections and appears to also increase risk of infection after treatment has ended, irrespective of liver disease severity. This might partly explain why early improvements in liver function attributable to prednisolone did not increase patient survival. Vergis and Atkinson et al state that although there was no overall association between presentation with infection and mortality, baseline infections might be dangerous. Decisions regarding continuation of antibiotic therapy are important when patients are to receive prednisolone. 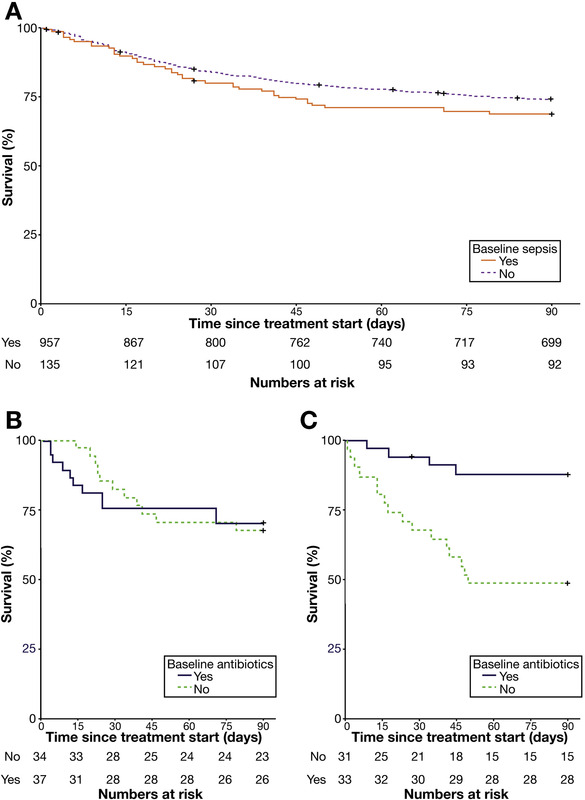 Continued antibiotic therapy in patients with baseline infection increases chances of survival. The authors also conclude that it is possible to identify patients at greatest risk of infection by measuring levels of circulating bacterial DNA. Infections might be avoided and mortality reduced by prescribing prednisolone only for patients with low levels of bacterial DNA.